The Case Study Template is displayed as a ‘case study card’ that poses a scenario. The Case Study Template is displayed as a ‘case study card’ that poses a scenario; Participants must then think of an appropriate response to that scenario. Participants can then ‘turn’ the case study card to see what their response to the scenario should have been. This makes the Case Study Template great for testing decision making and responses, especially for health and safety related topics. The Case Study Template’s ‘flip and reveal’ structure means that it can also be used to simulate flashcards. Step 1: Select the Case Study Template from the ‘Text, Images & Video Templates’ panel. Step 2: Drag your Case Study Template into the Lesson Pathway. Step 5: From the edit screen, you can choose to change your title and give your Case Study Template a description. Step 6: Click the ‘Add new Case Study’ button to start creating your first Case Study. 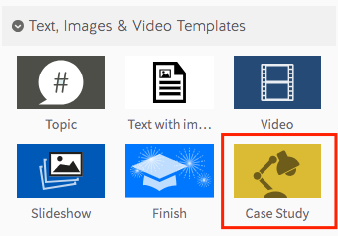 Step 7: From the ‘Adding New Case Study’ screen, you can add a title and description for your new Case Study. Step 8: Add an image for your Case Study using the ‘Add Image’ button. Step 9: Select whether you’d like to activate the ‘Flip Card’ option. Doing this turns your Case Study into a flashcard, allowing Participants to click on the card and reveal information on its back. Step 10: Once you’ve finished making your Case Study, select the green checkmark to save it. Step 11: To add more Case Study options, simply follow the instructions from Step 6. Step 12: Once you’ve finished adding content, select the ‘Preview’ button to preview your Case Study Template.